"At the first hint of danger, act quickly to save yourself". 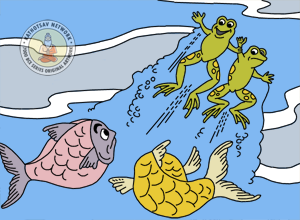 Two large fishes, Sahasrabuddhi and Satabuddhi lived in a big pond, and were close friends with a frog called Ekabuddhi. They spent a lot of time together on the bank of the pond. One evening, as they were assembled on the bank of the pond, they saw a few fishermen approaching. They had nets and big baskets with them, which were full of fishes that they had caught. 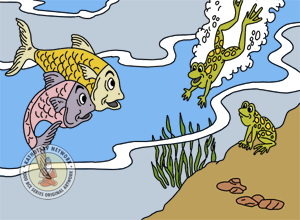 While passing by the pond, they noticed that the pond was full of fishes. One of them said to the others, "Let us come here tomorrow morning. This pond is not very deep, and is full of fishes. We have never caught fishes in this pond." They agreed to return the very next morning, and continued their journey homewards. The frog was depressed on hearing the fishermen and said, "O Friends, we should decide what to do, whether to run or hide. These fishermen will return tomorrow morning!" The fishes however did not care much. The first fish said, "O Friend, It is just mere talks of few passing fishermen. Don't worry, for they will not come. And, even if they do, I know innumerable tricky water movements. I shall save myself and my family with ease." The second fish joined, "I am as talented in tricky water movements as you! I will be able to save myself and my family too. I support your stand, for I will not abandon the home of our ancestors for the sake of some mere talk of few passing fishermen." But the frog was not convinced, he said, "My friends, my only talent is that I can foresee danger. You may stay, but I will leave with my family to some other pond before morning." The very next morning, the fishermen came and cast their nets all over the pond. They had a big haul, and caught many fishes, frogs, tortoises and crabs. Sahasrabuddhi and Satabuddhi tried hard to escape, but none of their tricks worked. They were caught, and when the fishermen dragged their net on the bank of the pond they were already dead. 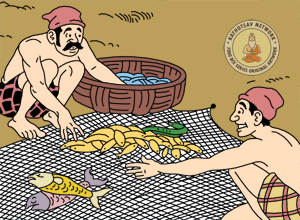 Being the largest of the fishes the fishermen caught, they proudly displayed Sahasrabuddhi and Satabuddhi, and carried them separately as they started homewards. 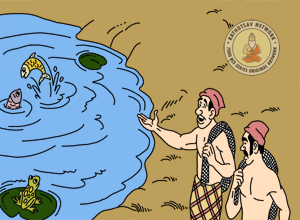 Meanwhile, the frog, Ekabuddhi, had already found a well for shelter. Being worried and anxious, he came to the surface. But as he saw the fishermen departing with his friends, he became sad. He told his wife, "They were very talented, but lacked the only talent that was most important. As for me, I may have only one talent, but I swim happily with my family!" At the first hint of danger, act quickly to save yourself.